George Alsop grew up in England during the years of civil war that divided the country. He was a strong supporter of King Charles I and was not happy when Puritan dictator Oliver Cromwell rose to power. In response, Alsop immigrated to Maryland in 1658. Alsop's training in London included a "handicraft apprenticeship. "1 He was a tradesman of humble origins. In order to get to Maryland, he signed a four-year contract of indenture with Thomas Stockett. This meant that Mr. Stockett would pay for his trip to Maryland if Alsop would agree to be his servant for four years after arriving in Maryland. Alsop enjoyed living in Maryland, but became very ill while living there. His illness probably began before he finished his four years of service.2 He returned to England in order to receive better medical care. While he recovered from his illness, he wrote a book about life in Maryland called A Character of the Province of Maryland. This book presented an idealistic view of life in Maryland. Alsop had lived in Maryland during a period of peace following the religious conflicts that took place during the English Civil War. Cecil Calvert had restored his power and installed his own son, Charles, as governor. Alsop wrote that servants received good treatment from their masters. Alsop also recorded how indentured servants lived and worked, and how tobacco was produced and used in Maryland. He hoped people who read the book would want to come to Maryland to live. Today, Alsop's book provides us with much information about seventeenth-century life and activies in Maryland. 1 George Alsop, A Character of the Province of Maryland, (1666; reprint Cleveland, OH: The Burrows Brothers Compay, 1902), 55. 2John Gilmary Shea, "Introduction," in Alsop, A Character of the Province of Maryland. (New York: William Gowans: 1869), 10. 3Alsop, A Character of the Province of Maryland, 1902 ed., p. 76. Alsop, George. A Character of the Province of Maryland. 1666. Reprint. Cleveland, OH: The Burrows Brothers Compay, 1902. Lauter, Paul, ed. "George Alsop." Iin The Heath Anthology of American Literature, 4th ed. Houghton Mifflin Company. George Alsop's book is available on the Maryland State Archives website at: A Character of the Province of Maryland (1666). With Notes by Newton D. Mereness, Ph.D., Reprint. Cleveland, OH: The Burrows Brothers Compay, 1902. Portrait of George Alsop from the 1666 original edition of A Character of the Province of Maryland(1666). With Notes by Newton D. Mereness, Ph.D., Reprint. Cleveland, OH: The Burrows Brothers Compay, 1902. Click to see a contact like the one George Alsop signed to become an indentured servant. 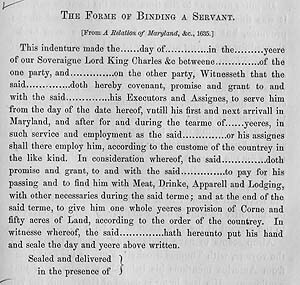 From "The Forme of Binding a Servant" [Contract of Indenture], from Jerome Hawley and John Lewger, A Relation of Maryland (1635), reprinted in John Gilmary Shea, "Introduction" in A Character of the Province of Maryland, George Alsop. (New York: William Gowans: 1869), 419.